In the French language, tomato is called “pomme d’amour”, or “love apple,” because the heart-shaped fruit was originally thought of as an aphrodisiac. Tomatoes were once thought to be poisonous, and it was only in the 16th century when the popularity of tomatoes rose. In 1820, the state of New York even passed a law banning their consumption! The truth was finally revealed on September 26, 1830, when Colonel Robert Gibbon Johnson consumed an entire bag of tomatoes before a shocked crowd on the steps of the courthouse in Salem, New York. And … he never died! In 1984 12.5 million tomato seeds (Rutgers California Supreme), were sent into space where they circled the earth for 6 years aboard a satellite, until the crew of the Columbia retrieved them. Back on earth they were distributed to more than 3 million school children, 64,000 teachers and others around the world. When planted, no significant differences were found between them and their terrestrial counterparts. Although there were no worrisome mutations, there were however, casualties. Dear Nasa, wrote one participant, My name is Matt. I am in grade 2. I really enjoy growing my plants. Here are my results. My earth seed did not grow. My space seed grew but it fell off my desk. It died. 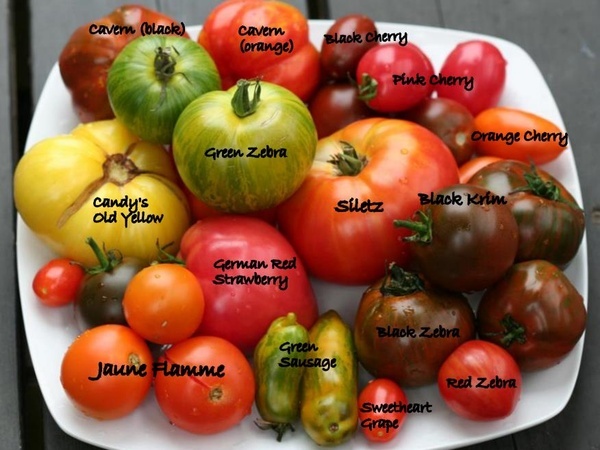 Tomatoes can be yellow, pink, purple, black and even white, as well as red. Tomatoes are rich in lycopene, an antioxidant, and have been found to be good for the heart and effective against prostate, lung and stomach cancer. An ounce of cooked tomato contains double the amount of vitamin C, as well as almost 20 percent higher beta-carotene, as compared to the equivalent sample of fresh tomato. The jelly-like substance around the seeds contains the highest concentration of vitamin C.